Bespoke plaster cornices handcrafted to a client's own design, nicely combining several stylesWilliam Wilson Architectural Mouldings Ltd don't use "off the shelf" plaster coving, cornices, centrepieces, dados or other mouldings. We use Handcrafted Plaster Mouldings meaning that each design and installation can be tailored in size and complexity to fit your property and taste. Totally bespoke. For example, for smaller rooms, we can make a narrower cornice or ceiling rose to suit. For large expanses of wall, panel mouldings can be used to provide a focal point and give character. Whether you're looking for ornate Traditional Plaster Mouldings or bold Contemporary Plaster Mouldings with sweeping straight lines, we can advise on styles to match the period and size of your property. We can design for you or work with your ideas to create something truly stunning and unique. In addition, we can match existing mouldings from any period, style or size, whether for a private home, business premises or historic building. 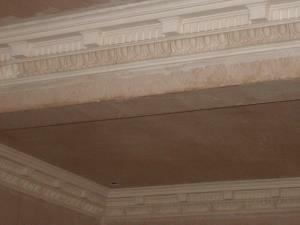 We also offer full specialist Plaster Moulding Restoration services. For examples of our Bespoke Plaster Mouldings work, please take a look at the Photo Gallery page. We can supply, fit and restore bespoke plaster mouldings to homes, businesses and historic buildings in: Accrington, Barrow, Blackburn, Blackpool, Bolton, Burnley, Bury, Carlisle, Chester, Chorley, Cumbria, Fleetwood, Garstang, Kendal, Lancaster, Leyland, Lytham St Annes, Morecambe, Oldham, Poulton-le-Fylde, Preston, Skelmersdale, Southport, Thornton-Cleveleys, Ulverston, Warrington, Widnes, Wigan, Wilmslow, Windermere, Wirral, and more!